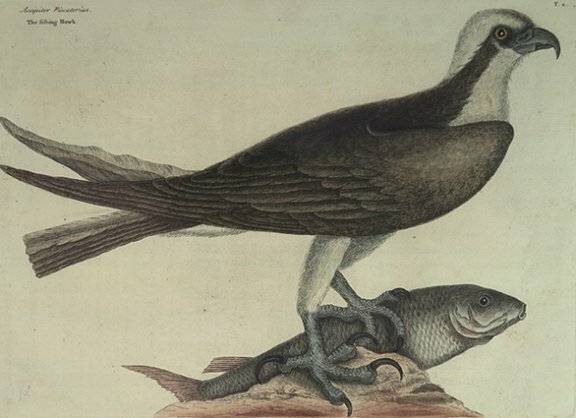 This Bird weighs three pounds and a quarter; from one end of the wing to the other extended, five foot, five inches: the Bill is black, with a blue sear; the Iris of the eye yellow; the Crown of the head brown, with a mixture of white feathers: from each Eye, backwards, runs a brown stripe; all the upper part of the Back, Wing and Tail, dark-brown; the Throat, Neck and Belly, white: the Legs and Feet are remarkably rough and scaly, and of a pale-blue colour; the Tallons black, and almost of an equal size: the Feathers of the Thighs are short, and adhere close to them, contrary to others of the Hawk kind; which nature seems to have designed for their more easy penetrating the water. Their manner of fishing is (after hovering a while over the water) to precipitate into it with prodigious swiftness; where it remains for some minutes, and seldom rises without a fish: which the Bald Eagle (which is generally on the watch) no sooner spies, but at him furiously he flies: the Hawk mounts, screaming out, but the Eagle always soars above him, and compels the Hawk to let it fall; which the Eagle feldom fails of catching, before it reaches the Water. It is remarkable, that whenever the Hawk catches a Fish, he calls, as if it were, for the Eagle; who always obeys the call, if within hearing. The lower parts of the Rivers and Creeks near the sea abound most with these Eagles and Hawks, where these diverting contests are frequently seen.